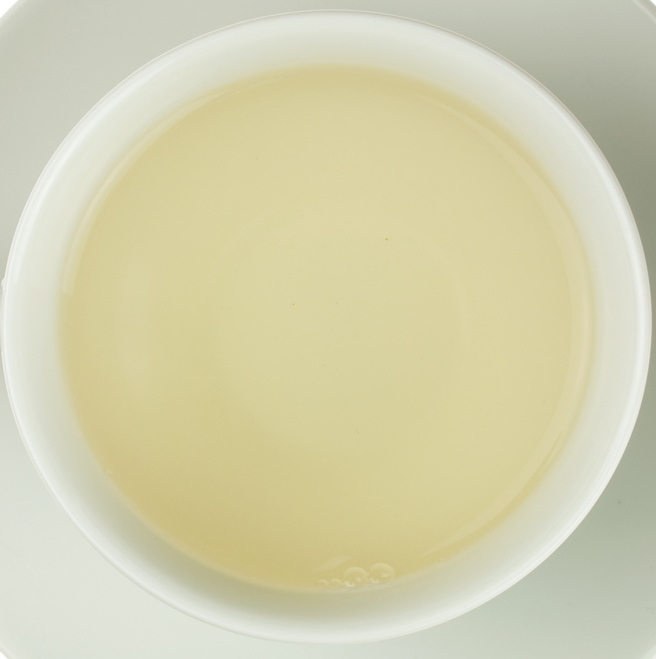 White tea became priced during China's Song Dynasty (960-1279). It was the choice of the royal court. It was given as tribute to the emperor. 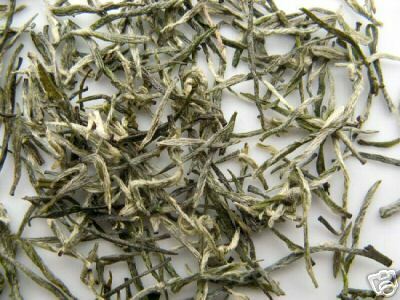 White tea leaves and buds were ground into a silvery powder, which was then whisked in bowls during the Song Tea Ceremony. This was the inspiration for the famous Japanese Tea Ceremony. One Song Emperor was renowned for his love of white tea. Hui Zong (1101-1125) became so obsessed with finding the perfect tea that he lost much of his empire. Over the next several centuries, powdered white tea and the Song Tea Ceremony were abandoned for loose-leaf tea. In 1885, select varieties of the tea plant were developed for white tea. Most tea drinkers are unfamiliar with it. White tea is fairly new in the Western market. It is under its own classification. The best way to understand this tea is through its characteristics, harvesting and processing. The processing in this group entails drying in the shade and curing it in the breeze. Has the lowest caffeine content. The taste is refreshing, refined and mild. Excellent to stimulate the digestion after a heavy meal. The price of white tea to be higher than other varieties. 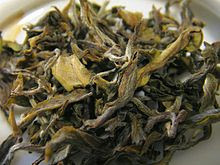 Made first in China however India and Sri Lanka is beginning to produce white tea. It is commonly seen as a specialty of Chinese Fujian province. The main white tea producing areas include Fuding, Zhenghe, Songxi, and Jianyang counties. and slight oxidation, very carefully controlled in processing. Processing for white tea entails fresh tea leaves are left to wither for up to 3 days. The leaves are then sunned or oven dried using relatively low heat and no rolling to reduce moisture to 5% or lower. to kill the enzymes and stop the oxidation process. 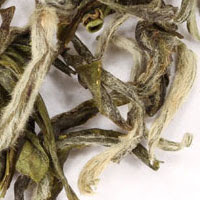 White tea comes in several varieties and types. 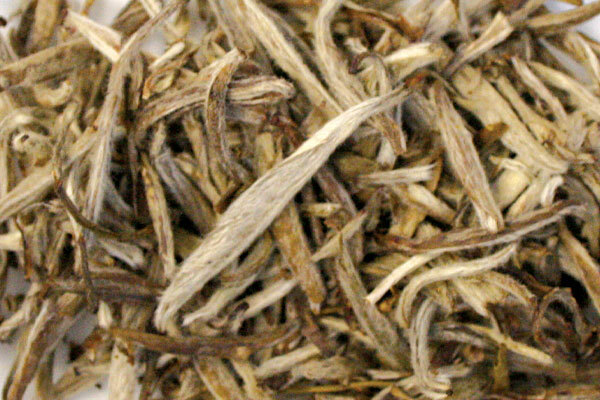 Snow bud (Xue Ya) — More affordable and has the subtlety and delicacy of white tea. 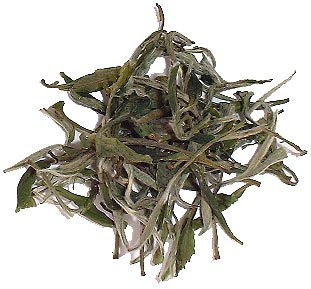 Silver Needle (Yin Zhen) — Highest quality white tea - made entirely of undamaged, unopened buds. 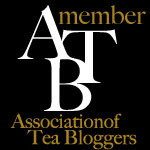 Categorized by some Chinese tea experts as one of the 10 Great Chinese Teas. Hand picked during early Spring before the buds develop into leaves. Produced in the Fuding and Zhenghe counties of Fujian province in Southern China. 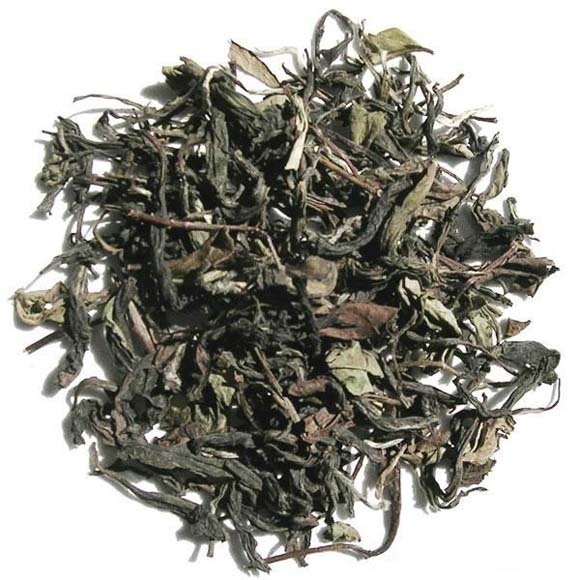 White Peony (Bai Mu Dan) — 2nd highest quality of white tea. Consisting of a bud harvested with two leaves. 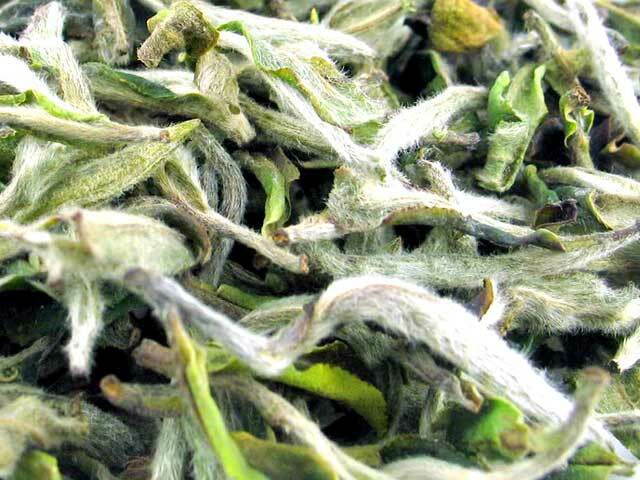 It comes from the same kind of tea plant as Silver Needle, and the buds and leaves are covered with the same white down. 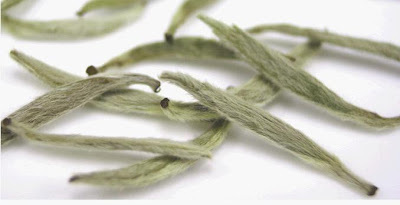 Tribute Eyebrow (Gong Mei) — The leaves for this type of white tea are plucked after Silver Needle and White Peony are harvested and so contains mainly young leaves and a small amount of buds. Longevity Eyebrow (Shou Mei) — The 4th grade of white tea, produced in Fujian Province and Guangxi Province in China. A fruity, furry, chaotic mix of tips and upper leaves that steeps up a liquid with a stronger flavor than other white teas (similar to Oolong). It is plucked later than Bai Mu Dan and may steep a darker color. Song Yang — A meticulously harvested and exclusive white tea where it takes about 3,000 tea leaves to make one pound. It is handcrafted in the Song Yang region of Zhejiang Province, China. Other Varieties — The growing popularity of white tea has prompted producers in India to produce a version called Darjeeling White. It is similar in appearance to Silver Needle, commonly consisting of only buds. Ceylon White and Silver Tips from Sri Lanka. Japanese tea growers also have begun producing small quantities of white tea.